Kauna is the local name for a reed or rush which is cultivated in the wetlands. It has a cylindrical..
A simple but elegant product from RISTA handicrafts made of sabai grass,hand woven intrica.. 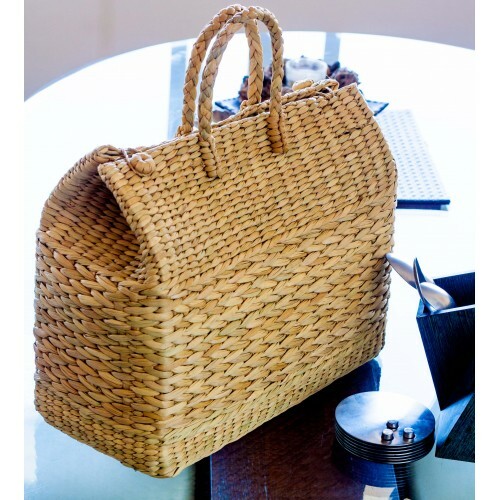 The finely woven ropes of Kauna grass are turned into bags by Odisha folks.Cute small handle en..
Kauna is the local name for a reed or rush which is cultivated in the wetlands. It has a cylindrical, soft and spongy stem which is woven into mats,cushions and mattresses.The basket comprises of finely woven Kauna grass and two small knobs for closing purpose. Extremely stylish, washable and sun dried, less maintenance required. Campers baskets is used for picnics and lunches. Stylish and practical with 2 buttons to close it and also Light weighted . Can be washed and sun dried . Dimensions : 12 " breadth x 11 " length x 6 " depth and a handle of 4"